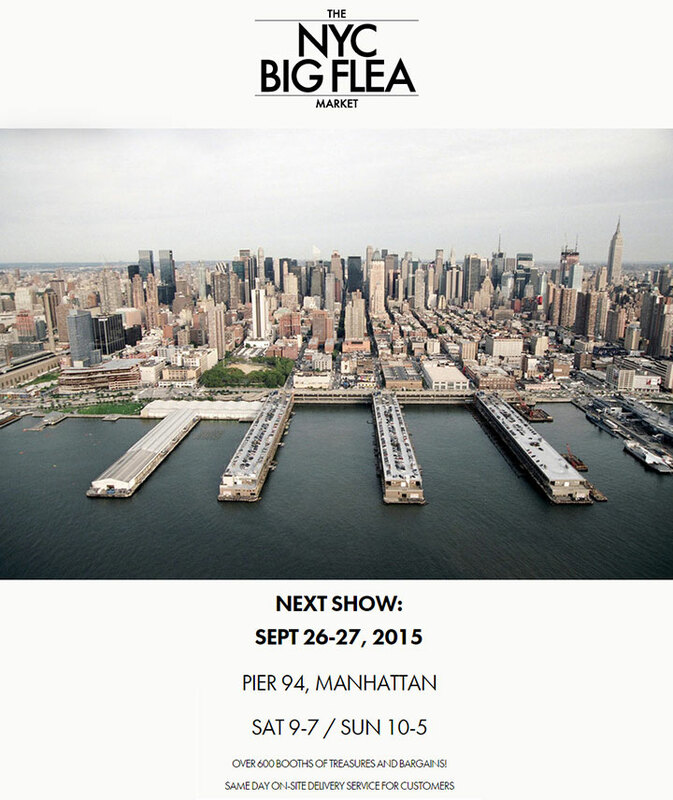 James D. Julia, Inc. held a 4-day Summer Fine Art, Asian, & Antiques Auction, August 25-28, 2015. I’m only reporting on the lots that interest me, but you can view the entire sale by clicking the link in the fifth paragraph below. For this auction it was lot #3061, a Handel lamp, and #3327, a Tiffany Favrile lamp. 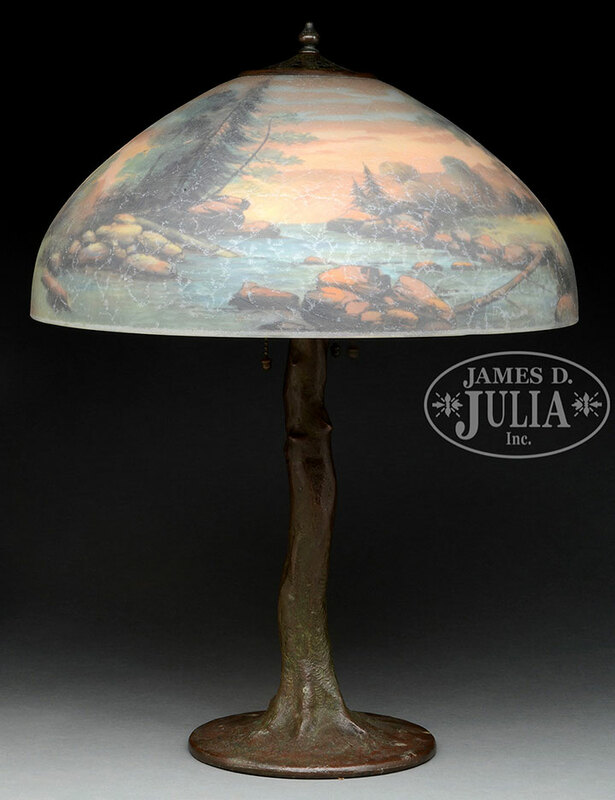 Lot #3061 was a rare and really beautiful 18″ diameter scenic table lamp with a rocky stream and tree trunk base. It sold for $10,665, including buyer’s premium, against a pre-sale estimate of $3,000 – $5,000. At one time, this was a $25,000 lamp, but since I’m not sure of today’s price, I dropped out as the underbidder. Reverse-painted lamps are difficult to photograph, but I know from experience that it’s much more beautiful in person. Lot #3327 was an interesting Tiffany Favrile table lamp, with two unusual features. First the base was matching glass (Favrile shades usually have bronze bases). Secondly the decoration on the shade was completely wheel-carved (engraved) by hand when the shade was cold. Favrile lamps are more commonly decorated by the gaffer when molten, frequently with wave decoration. It did have a couple of flaws — some original folds on the underside and an unsoldered arm on the fitter (which is easy to fix). Estimated to sell for $4,000 – $6,000, it realized $8,887.50, including buyer’s premium. For the complete results of the sale, click here. You will have to sign in (free) to see the results. 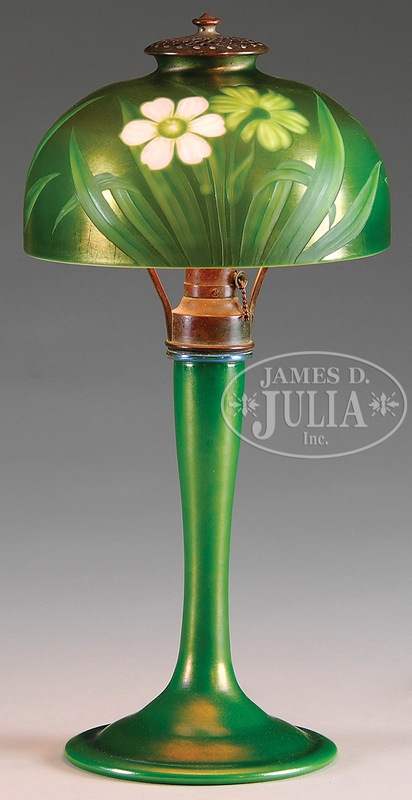 This entry was posted in Auctions, Tiffany and tagged chasenantiques.com, Handel lamps, James D. Julia, Julia auctions, Philip Chasen, Philip Chasen blog, Tiffany Favrile, Tiffany Studios by Philip Chasen. Bookmark the permalink.